2016 promises to be another Big Year in the life and work of Mull Otter Group. 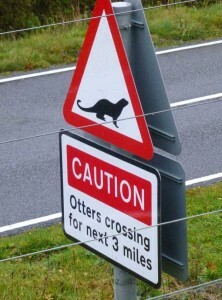 MOG has been given the green light to seek permission from local landowners to erect more Otter Warning! road signs at known otter fatality black spots around the island. We hope to have the first of these new signs installed very soon into the New Year. Argyll and Bute Council has agreed to MOG’s plan to trial the effectiveness of otter reflectors on a stretch of road on the island that has proved to be the worst for otter mortality in recent years. This trial, which may last for 5 years, is potentially viewed as being the best way forward in counteracting the number of otters that are dying on the island’s roads. These are projects that have been ongoing for the past 2 years, as we awaited the permission to continue with our plans. It was a time of much head scratching and tearing hair out in frustration, but the belief that we have in what MOG is trying to do held firm, effectively turning a negative into a positive…for otters!